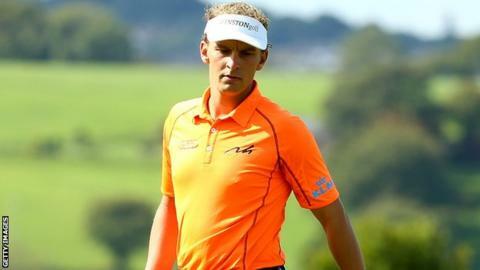 Dutchman Joost Luiten clung on through a turbulent final round to win the Wales Open at Celtic Manor. Bogeys on the opening two holes caused the 28-year-old to lose his two-stroke advantage and, at one stage, he was in a five-way tie for the lead. However, a birdie on 15 put Luiten one ahead of the field going down the last. Despite missing the fairway, two putts secured a 71, leaving him 14 under and one ahead of England's Tommy Fleetwood and Shane Lowry of Ireland. "It was tough, it was hard work down the last," said Luiten, who claimed his fourth European Tour title after back-to-back top-five finishes. "I didn't get the start that I wanted. I knew it was going to be a tough day and I just tried to hang in there and a good par down the last was enough." Luiten needed several minutes to find his ball in dense rough beside the final fairway but, when he finally reached the green of the par five in three, his first putt from distance was good enough to leave him a tap-in for the title. Had he dropped a stroke, he would have entered a three-way play-off with Fleetwood, who picked up four birdies and an eagle on the final five holes for a 67, and Lowry, who birdied the last for a round of 70. Behind that pair came a five-man group on 12 under, including Jamie Donaldson, playing his final round before joining up with the Europe Ryder Cup team. The Welshman, eight under overnight, went round in 67, with bogeys on the second and 13th ultimately costing him the chance to challenge Luiten. Donaldson ended alongside Eddie Pepperall, Marc Warren, Edoardo Molinari and Nicolas Colsaerts. Colsaerts also carded a 67 to set the early clubhouse target of 12 under before being overhauled by Fleetwood. The Belgian, a Ryder Cup winner in 2012, will be part of BBC Radio 5 live's commentary team next week at Gleneagles. Denmark's Thomas Bjorn and England's Lee Westwood, also part of the European team, were three over and five over for the day respectively, ending well down the field. Venue: Gleneagles, Scotland Dates: 26-28 September Start times: 07:35 and 13:15 BST on Friday and Saturday and 11:36 BST on Sunday. Coverage: Live radio and text commentary on BBC Radio 5 live, online, tablets, mobiles and BBC Sport app. Highlights on BBC Two.